Egon is a friend of Kai-Michael, my friend and business partner in MakemyWorlds. Kai knew if he got Egon interested into Second Life, something unique could come out of his mind. And one day, I met Egon Koch, an artist, an author, an elegant man of sensibility and sensitivity. It was a short meeting, thru a video-chat. I explained him what Second Life had done for me, how it allows me to be able to discover so many different people I would never even have looked in real life. How it changed my perception of the reality and helped me to grow up. And how, that made me richer inside. I think I tried to communicate him the magic of Second Life. 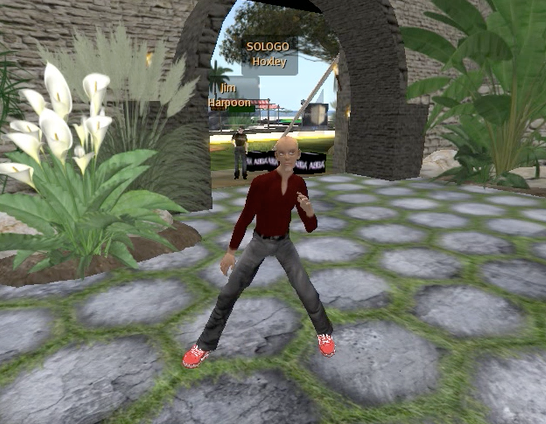 A few month later, I met a very special noob in Second Life, under the name of Sologo Hoxley. Sologo was a funny avatar, who wanted to see and know everything. He was not working as a journalist, but as an author, getting deep into our second life, taking time to listen each individual story, making no judgment, just listening. He was from every events, every parties, conferences or concerts, and in a few weeks, seems to know more than me of what was happening in SL communities. One day, Sologo Hoxley disappeared, not showing on anymore in my friend's list. Sologo was just gone. He had finished his work and time was starting for him to tell about his adventures like those old writers-journalist who were crossing the world as the beginning of last century. Tomorrow June 2nd, the story of Sologo Hoxley "Windows of the World" will be broadcast on the german radio SWR 2, 2nd June 2010, 22.05 - 23.00 clock GMT+1 . In the same time, co-organized with MakeMyWorlds, the radio feature will be on air at Virtuelles Koeln in Second Life and Sologo will be with us. So if you understand deutsch or if you want to meet Sologo, join us at Virtuelles Koeln tomorrow ! See you there ! 0 Response to "Author Egon Koch aka Sologo Hoxley on air, June 2nd at Virtuelles Koeln"